I have question about CPU usage. Can someone explain to me what those 2 values are and what's the difference betwwen them (why is one lower than enother). "Max CPU/Thread Usage" is the maximum instantaneous usage among all threads/cores in the system, so on the screenshot it matches Core #1 which has actually the highest usage. "Total CPU Usage" is the arithmetical average usage of all threads/cores in the system (sum of all particular usages divided by their count). (11-24-2017, 02:40 PM)Martin Wrote: "Max CPU/Thread Usage" is the maximum instantaneous usage among all threads/cores in the system, so on the screenshot it matches Core #1 which has actually the highest usage. That's interesting ... task manager showing me 45% CPU usage overall, while HWinfo is apparently showing me only 17% total CPU usage. Now I get it that max cpu/thread usage means max load/usage on the most used core/thread, but it's still confusing to me why is task manager showing 45% total CPU usage while hwinfo only 17%. Yes, I have already noticed some discrepancy reporting the total CPU usage on Windows 10. But it seems that Task Manager is wrong here. I have used a dedicated Intel tool to put various constant load levels on different cores in the system. And HWiNFO reports well in sync with the expected levels, while Task Manager seems to report cca 20% higher usage per each core. 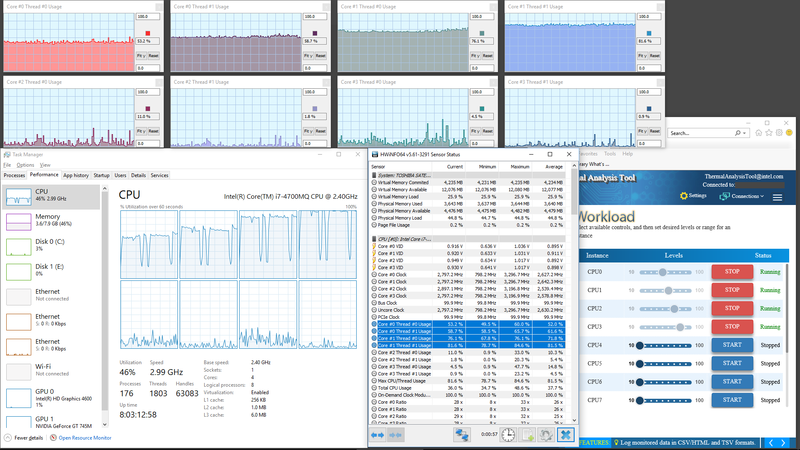 I have started 50%, 60%, 70%, 80% workload on the first 4 cores using the Intel tool. As you can see HWiNFO reports correct values, but Windows Task Manager higher numbers. Core4 which is loaded at 80% reports 100% most of the time. (11-24-2017, 08:49 PM)Martin Wrote: Yes, I have already noticed some discrepancy reporting the total CPU usage on Windows 10. (11-24-2017, 09:36 PM)Martin Wrote: And here the proof.